Anyone up for the sand this weekend? PM me. I think it was my fault anyway. I may have given people the wrong impression as my location was still listed as Victoria. 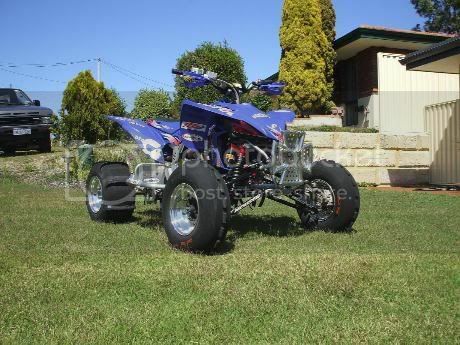 I don't know many of the WA quad crew as of yet and none of my mates have quads. what quad have you got? where about in perth are you? I'm in Joondalup, just a stones throw to Wanneroo road and about 50min to Sand Dune Heaven I suppose. I haven't been up there since Noah was a boy and I'm looking forward to a squirt in the dirt. I've got an 87 Tecate three wheeler, (no introduction required for 80's vintage ATV nut cases), a YFZ fourfiddy, and an LT-R.
Saturday aint good for me as I'm doing the house warming thing, but I'm good for Sunday morning If anyone is going to be up there then?